On April 17, 2015, an outbreak of faulty salad dressing from Conway Import Inc. and Schnucks Chef’s Express California Pasta Salad were discovered. The dressings were released into Illinois, Maryland, Georgia, Florida, Pennsylvania, New Jersey, New York, and Texas. The deliveries were done through direct action for the dressings. The pasta salad was distributed into 99 stores in Missouri, Illinois, Iowa, Indiana, and Wisconsin; the dates detected for the salad were from April 2 – April 14, 2015. “I enjoy eating a salad for lunch at school. Now knowing about the chance of illness in my salad, I might not buy as many salads through the school” said Stacy Hall, a student at Batavia High School. 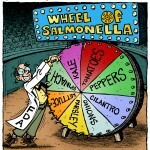 Currently no illnesses are on record of salmonella ever reaching someone through these products. The dressing and pasta were caught in time to protect the public. The pasta salad was sold in the store-bought “paid by the pound” section of the store. Students at Batavia High School eat salads everyday. They are a part of some kids’ everyday diet. More students around the school need to be aware of the causes through their diet. The affected dressings were in large plastic jars, one being an organic sesame ginger dressing and the other a citric organic vinaigrette dressing. As soon as the parasite was detected, all of the orders were discontinued until further notice. This bacteria can have a major affect on children. The parasite affects children faster than the average adult. The average healthy person would only experience minor effects from the sickness. In very rare occurrences people can end up with the organisms in their bloodstream and end up with more issues. Once people found out about the products being contaminated, they researched further information. On April 20, 2015, the Kane County Chronicle website announced the major recall on the salad dressings. According to the Kane County Health Department, there are multiple occurrences happening of a bacteria “infestation” in many foods. For some people, getting a salad for lunch is an everyday event. The dressings and pastas have been, for a majority, removed. The salads were in stores so, the facts are more uncertain. The reasoning behind the possible pasta contamination is from spinach from Taylor Farms. The spinach had a feasible contamination of salmonella. As soon as the stores had heard about the contamination, the shelves were cleared of the pasta and dressings. If any customer wanted to return their pasta in fear of Salmonella they were allowed to return it to the nearest location selling the product for a full refund. The reason for the salad dressing being affected is still being researched. Students are concerned for the health of themselves. The contaminated food amount is spreading quickly, not only to the salads but in dog treats, pine nuts, and raw milk from Pennsylvania. The amount is only increasing.